Hi! 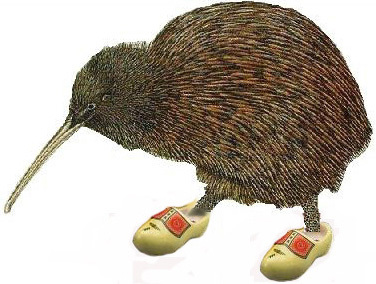 I'm a Dutch Kiwi. This is a reference page of things that interest me but you're welcome to browse. The above stamp was issued to comemorate dutch explorer Abel Tasman's discovery of New Zealand. The first Europeans known to reach the South Island were the crew of Dutch explorer Abel Tasman who arrived in his ships Heemskerck and Zeehaen. In December 1642, Tasman anchored at the northern end of the island in Golden Bay which he named Moordenaar's Bay (Murderers Bay) before sailing northward to Tonga following a clash with Maori. Tasman sketched sections of the two main islands' west coasts. Tasman called them Staten Landt, after the States-General of the Netherlands, and that name appeared on his first maps of the country. Dutch cartographers changed the name to Nova Zeelandia in Latin, from Nieuw Zeeland, after the Dutch province of Zeeland. It was subsequently Anglicised as New Zealand by British naval captain James Cook of HM Bark Endeavour who visited the islands more than 100 years after Tasman during (1769–1770).